If you are based in Croydon and require the services of a skilled electrician, South London Electricians will be happy to come along and assist you. It may be a large-scale commercial project or some simple rewiring in your home, but whatever it is we want to make sure you get the right level of assistance as quickly as possible. We are based in Croydon, so we are in the ideal location when it comes to helping people in the Croydon Borough. Just some of the areas we cover in the Croydon Borough include South Croydon, East Croydon, Purley, Whyteleafe and Kenley along with Hamsey Green, Thornton Heath and Sanderstead. This means we are able to comprehensively cover the entire Croydon Borough to help those in both domestic and commercial environments with installations, repairs and safety checks and anything else which may improve the electrical operation of your site. Along with Croydon, we are also able to help those in surrounding areas such as London and the Home Counties, so if you don’t live in Croydon specifically but would like to take advantage of our competitive rates and efficient services it is worth getting in touch, especially if you are from the areas close to Croydon. You will always speak to a qualified electrician, so even if we can’t get to you right away we may be able to offer the advice you need over the phone. We have many years of experience as electricians in both the domestic and commercial markets, and we have taken care of some massive projects in the past as well as all of the standard home wiring tasks that can be crucial when it comes to getting your house working as it should. This might be helping you rig up your new home cinema system, sorting out problems with your internet wiring or simply sorting a dodgy connection that frequently cuts out. Whatever it is, we will be happy to help. No task is too big or too small for South London Electricians, and we have worked with some very big clients and we are equally happy setting up a new store as we are helping you get the electricity in your home working properly, so please don’t hesitate to get in touch with any job you think we could help you with. 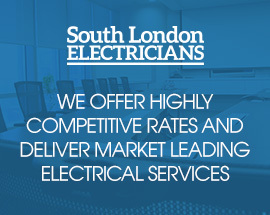 To find out more about the services we offer, please contact South London Electricians today for a quality team of Croydon electricians.